Here is more information to enable the student to begin reading Greek icon inscriptions. This does not make for thrilling reading, but it is essential for those who seriously want to understand icons. You already know one of the most common Greek inscriptions because it is also used in Russian icons: IC XC. Those are the letters abbreviating Ιησους Χριστος — ΙΗΣΟΥΣ ΧΡΙΣΤΟΣ — IESOUS KHRISTOS — JESUS CHRIST. They are found (logically) on icons depicting Jesus. The other inscription you already know from the posting on Russian inscriptions is MP ΘΥ abbreviating Μητηρ θεου — ΜΗΤΗΡ ΘΕΟΥ — METER THEOU — MOTHER OF GOD. Meter in Greek is “mother,” and Theos is “God.” When it is written as “theou,” it means “of God” — thus “Mother of God.” That inscription is found on icons of Mary. Remember that the horizontal squiggle (which I have not included here) is written above letters to mark them as abbreviations. The other very common inscription found on Marian icons is ΘΕΟΤΟΚΟΣ — Θεοτοκος “Theotokos,” meaning “Birth-giver of God.” In Eastern Orthodox belief, Mary gave birth to God as Jesus. This title was hugely controversial in early Christendom, and caused great theological conflicts, but those favoring calling Mary essentially “Mother of God” won out. Winning factions in Orthodox theological conflicts often had the most power and political support, not necessarily the best argument. There are, however, different kinds of saints, and some categories of these are distinguished by their own titles. For example, if we are looking at an icon of a saint who has the title ΟΣΙΟΣ — HOSIOS instead of HAGIOS, then we know we are looking at a monastic saint, a monk of some kind, and he will likely be wearing a monk’s garb. Given that there are different saints having the same name, the title Hosios will distinguish one who was a monk from one who was not. 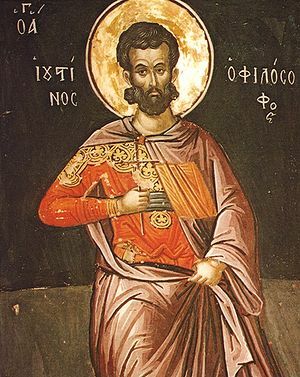 By now you should be able to easily read the inscription on the first image pictured below: HO HAGIOS ANDREAS — “Saint Andrew.” Remember that in icon inscriptions, the letter “S”, which is Σ (sigma) in Greek, is often written as C. Notice how the I (iota) in HAGIOS has been fitted in just below the crossbar of the Γ (gamma). Linking of two letters like this in icon inscriptions is very common. Now look at the second icon image below. It illustrates some of the oddities of Greek icon inscriptions. First, the triangular arrangement of the letters ΟΓΑ may mystify you until you realize that it is just an abbreviation of the word ΑΓΙΟΣ — HAGIOS — meaning “Saint,” with the “g’ in Hagios placed above the letters O (for “ho”) and A, beginning the word “Hagios. Once you know that, you can read it on every icon in which it is abbreviated like this. Now look at the word below it. It is ΙΟΥCΤΙΝΟC — IOUSTINOS, which is Greek for the name “Justin.” Notice, however, that the Y (which looks like a V here) is placed right atop a very angular, diamond-shaped O. And that next odd-looking letter is just a T with the preceding C (alternate form of Σ) made much smaller and attached just below the left side of the crossbar on the T.
On the right side, what looks like one word on the first line is really two, and it continues onto the two lines below. It is Ο ΦΙΛΟCΟΦΟC — HO PHILOSOPHOS. You already know that HO (the O) means “the.” And Philosophos means “philosopher.” So this is O HAGIOS IUSTINOS HO PHILOSOPHOS — literally “The holy Justin the Philosopher.” This is the person generally known in the West as Justin Martyr, which is why he holds a cross in his right hand, as is customary for martyrs in icon painting. Note how the last C (in Greek) of Philosophos is written smaller and at an angle just below the rest of the word, with a little ornamental squiggle attached to its base — but once you know it is just C (Σ-sigma), it is easy to recognize in other icons, even when that ornamental squiggle is longer.If you learn bit by bit like this, you can soon read huge numbers of titles of saints in Greek icons. It is not difficult, and you do not have to learn the entire Greek language to do it, because, as with Russian icons, these titles are very repetitive. So a little learning goes a long way. Look about for a few minutes on Internet icon sites, or read the beginning of most any popular book on icons, and you will find a great deal made of the notion that icons rely on something called “reverse perspective” or “inverse perspective,” which theoretically opens up the space of an icon so that, as various people phrase it, “the viewer is part of the icon,” or “God in the icon looks at the viewer,” or “the icon looks at the viewer rather than the viewer looking at the icon.” Now if such statements seem to you initially to be nonsense, hold on to that feeling; you are on to something. The truth is that this whole matter of inverse perspective is just another one of those myths associated with the painting of icons, and a rather confused myth at that, because many writing on the topic do not seem to understand that reverse perspective is by no means a characteristic of all icons, or historically limited to icons, nor do all who write about it grasp what reverse perspective really means. The Frenchman Gabriel Millet (1899) noted the “birds eye view” approach in medieval mosaics, combined there with the incompatible increase, with growing height, of receding lines. Dmitry V. Ainalov (1900) — in Russia — used the term “reversed perspective” (обратная перспектива/obratnaya perspektiva) for stylized characteristics in icon painting, attributing it to the inability of the artist to make correct foreshortening (see http://kurt.plommon.se/ljuset/a2.htm — summary of “Inverted Perspective in Visual Art and Controversy: A History of a Critical Concept from the Past Century” [In Swedish], Uppsala University, 2001). The German art historian Oscar Wulff wrote of umgekehrte Perspektive (reversed perspective) in 1907, and In the 1920s the notion was taken up by the Russian writer Pavel Florensky. To put it simply, natural, linear perspective means that if we look at a straight road, considering both sides of the road to be lines, then the farther away from us that road gets, the closer the lines will be to one another, until finally, at the horizon they will meet, forming a very elongated “V” with its widest point closest to us, and its narrowest point farthest. We can imagine such a road painted on a flat board. Inverse or reverse perspective is just the opposite. In reverse perspective, if we were to look at that road, again painted on a flat board, its lines would be widest farther away from us, and though the nearest end of the road would not be visible on the board itself, if we were to follow the lines of its sides as they narrow, we know that theoretically they would meet out in the space where the viewer is standing — at least roughly. So we can see that reverse perspective is just the opposite of normal perspective, thus the name. Now normal perspective was rediscovered in the Renaissance, though some Roman artists had known and used it over a thousand years earlier. Nonetheless we can say, in general, that normal perspective was not known to most early artists. So those artists had to find a method for showing what they wanted to show of, for example, a group of buildings on a flat surface. They were not as concerned with making it look realistic as they were with just “getting everything in,” with a reasonably harmonious composition. So we will often find lines in old, pre-Renaissance paintings — including some icons — going in a number of directions, sometimes including reverse perspective, but often with multiple-point perspective in which there is no overall focal point of the perspective either inside or outside the painting. We often do find — particularly in pre-17th century icons — that flat surfaces such as tables, footstools, and rooftops are “tipped” toward the viewer — the back side raised higher than the front — and sometimes the back side will be wider than the front, contrary to normal perspective. However, in spite of the “reverse perspective” myth, this generally does not create a single focal point in the viewer’s space. Nor does it have the supposed effect of making the viewer “part of the icon.” And in some cases, background buildings will have a left-side roof slanting upward, while on the right another building’s roof slants downward, confusing the perspective completely. It takes only a few examinations of such icons by a perceptive viewer to realize that what is characteristic of such icons is not “reverse perspective” in the sense in which it is generally promoted in religious art, but rather abstraction as a virtue. Unfortunately, it is rare for anyone writing about reverse perspective in icons to actually examine its validity; most just repeat it as an assumed fact without the least firsthand critical investigation. If we examine the back upright posts of the chair, we see they are both rectangular in shape, and both are oriented toward the left. If this were an example of reverse perspective they would slant toward each other. That on the left would slant toward the right, that on the right toward the left. They do not. If we look at the front upright posts of the chair, we see that they match the back pair in orientation; both are rectangular in cross section, both slant toward the left, rather than slanting toward one another as would be the case in reverse perspective. If we look at the chair supports (“feet”), we see that both on the left are oriented toward the right of the painting. The rear support is higher on the panel than the front support. If we draw a line through them, it would slant downward from left to right. We see precisely the same orientation in the chair supports on the right side, which would not be the case in reverse perspective, in which those on the right would form a line slanting downward toward the left. In addition, both top crosspieces joining the rear uprights to the forward uprights slant uniformly downward to the right, creating theoretical lines that would not meet in the space where a viewer stands. On the footstool, we see that the platform is wider at the rear than at the front. If we were to draw a line along left and right sides, we see that those lines would theoretically meet on the right side outside the panel. This would be reverse perspective in a sense, but the focal point in this case would be considerably to the the right of a viewer standing in front of the panel. And we find on looking at the feet of the footstool that their positions contradict the supposed reverse perspective of the platform. As in the case of the chair supports, the footstool supports in back are both higher than those in front, and both back footstool supports are to the upper left of the front foot supports, again both creating, if we draw a line through them, lines that slant downward from left to right. Note particularly that the right rear footstool support is placed to the left of where it would actually be in a “real” footstool — it is not placed at the rear corner, but illogically to the left of it. What we are seeing here, therefore, is not an image characterized by “reverse perspective,” but rather an image characterized, as are many icons, by stylized abstraction of elements. They do not “draw the viewer into the painting” nor do we find that the painting “looks at the viewer rather than the viewer looking at the painting.” And, quite contrary to being a classic example of reverse perspective, we find this painting is simply an example of stylized abstraction (Incidentally, this image, known as the Kahn Madonna, is of very uncertain origin. Where it was painted is not known, and even whether it was painted by a Byzantine master or by a Byzantine-influenced Italian master is still debated). Often, as already mentioned, old icon painters liked to show the tops of things, as though flat surfaces were tilted toward the viewer instead of being upright. That enabled them to show, for example, a person standing on a platform with much of the platform actually seen, instead of a person just standing on a line. There was sometimes an effort to show more than one side of a square or rectangular object, which resulted in odd geometrical forms rather like early versions of David Hockney’s efforts to show objects from multiple sides. And also often (but not always) the size of a figure indicated its importance, or indicated to the viewer the most significant part of an image. What we do know is that even in so classic and oft-quoted an example as Andrei Rublyov’s “Old Testament Trinity,” the odd perspective does not have the effect that the popularizing writers of recent icon books tell us it has. One does not get the feeling that the focal point of the image is in the viewer’s space. Instead one merely notes that the painter has arranged the planes of the image so that it may be fitted harmoniously into the rectangular space, with planes near the bottom slanting downward, and planes near the top (the building at rear left) slanting up. The eye is drawn into the image not because of “reverse perspective,” not because of the two inward-slanting platforms on which the feet of the side angels rest, but simply because the position of the three figures is reminiscent of actual perspective, with the central figure placed higher on the flat surface than the two side figures, creating a kind of visual hollow space that attracts the eye to the stronger colors of the central angel’s garments. There is a bit more to it that might be said, but none of it has to do with “reverse perspective.” If you doubt that, just cover the lower portion of the icon and examine the result. Over time, abstraction in icons hardened into dogma for some believers, such as the Old Ritualists, who refused to accept the more “realistic” Western European styles adopted in the 1600s by the Russian Court and gradually by the State Orthodox Church as well. They kept the painting of “abstract” icons going through the reign of Tsar Nicholas II and into the 20th century, though not entirely without some Westernizing influence in their art. It is worth remembering that when portrait icons of secular individuals began to be painted in Russia in the 17th century, they too were painted on wooden panels and in the same stylized manner as icons. The difference was the absence of a halo. These parsuna portraits (from Latin persona — “person”) were a transitional phase into more realistic, “Western”-influenced paintings on canvas that soon replaced them. A similar explanation was contrived for why, when one looked at abstracted scenes representing, for example, the birth of Jesus, they did not look at all realistic even though the event took place on earth, not in heaven. The explanation came to be that one was looking at the event “as it is in eternity,” meaning it no longer is limited to the historical, earthly time and place where it originally happened. It was now a “timeless” event that is always happening. Jesus is always being born; Jesus is always being crucified. So again, the explanation was that in a sense, one was looking at an event in its “heavenly” aspect. Eventually gold leaf was applied to the backgrounds of icons to create a reflective svyet’ or light, representing the light of the heavenly world, the transfigured world, in which there are no shadows. But of course gold was not cheap, even in leaf form, so only those with money could afford such icons. Others had to make do with a “light” consisting simply of paint, or perhaps of tin leaf coated to make it look like gold. Given the abstraction and distorted perspective of old icons, it is easy to see why, over time, the belief arose that these were characteristic of a heavenly, “transfigured” world in which the normal laws of perspective and form — and even time — no longer applied. First comes the practice — then comes the belief “explaining” the practice. We see the unnatural perspective of old Russian iconography even in the model sketches used by painters, such as in the example of the Predstavlenie — the Presentation — of the body of the monastic saint Feodosiy Pecherskiy. Look at the lines of the upper portions of the buildings at left and right; look at the impossible viewing angles of the round windows in the central building, all different; look at the two arched windows in the middle of the central building, presented as they would be if simultaneously (and impossibly) viewed from both far left and far right sides; look at the windows in the upper buildings at left and right, again viewed from two completely opposite directions. Now look at the people standing on both sides of the image. Those farther from the viewer are not represented as larger, as would strictly be the case in reversed perspective; instead, their heads are simply represented as higher on the flat suface, which is how they would be seen in normal perspective, but as we have seen, neither normal perspective nor reversed perspective are characteristic of the sketch as a whole. Put simply, nothing makes sense in the mixed, abstract perspective used by the artist. This is typical of old iconography, and it is not “reverse perspective,” but rather impossible perspective. This non-realistic approach eventually came to be explained as representing the “heavenly, transfigured world”, in which the normal laws of perspective do not apply, nor do those of light and shadow. Not exactly a description one could put on a milk container, but it is all an icon painter needed. So it is important to realize that icons were a system of abstractions and conventions, and that painters’ manuals were code books for these abstractions and conventions. When a patron went to an icon painter and said he needed an icon of St Panteleimon, the icon painter knew the code for that saint, and the patron often did too, at least for the more prominent saints, because he had seen them before in churches and on other icons. Nonetheless, painters made mistakes. Sometimes a saint is given an incorrect name, or a name is given an incorrect body. To an illiterate patron that did not make a great deal of difference, as long as he thought he knew who was painted in his icon. There were other coded conventions in icons. For example, the cloth hanging between two buildings, as in the illustration at the top of this article, indicated that an event was to be understood as taking place in an interior, even though it was not shown in an interior. So if one put, for example, a scene of the birth of Mary before such buildings, the hanging cloth (commonly red) meant the scene was to be interpreted as taking place indoors rather than outdoors. That cloth is called a velum, originally a Latin word meaning a cloth, curtain, awning, or sail. What does one learn from all this? Just remember that traditional icons were an art of codified abstractions, and of course keep in mind that icon painting has always been a system of reproduction of such coded images. It is not an art of originality. Given such a system, it is no wonder that when mechanical lithography was invented, the sales of painted icons dropped drastically. Oh yes — one final note: Saints in icons generally do look at the viewer, but that is only because (except in narrative icons) they are painted with eyes looking forward. The reason is that an icon is an object of prayer in which the supplicant addresses the saint. So while the supplicant looks at the icon, the eyes of the painted icon saint look at the supplicant. It has nothing to do with reverse perspective; it just means icon painters knew a saint looking at a viewer would seem more like one interested in answering a viewer’s prayers than one with eyes turned away. And it certainly does not mean that a saint (“the icon”) looks at a viewer rather than the viewer looking at the saint (“the icon”).